If you use your Mac to run a business or another activity where you can’t afford to lose productivity, do not upgrade to High Sierra until you’ve made plans to fully recover your previous configuration if things don’t work out. (That applies to any operating system upgrade on any device.) Wait until you are confident that all of your software and hardware is compatible, then back up everything, then upgrade. To make the best use of my time and yours, I focus on verified reports or reports acknowledged by Adobe, and generally avoid repeating random anecdotes. But I do mention my own experiences. Note: On October 18, 2017, Adobe announced the 2018 release of Creative Cloud applications and made them available for download. These are the most compatible with High Sierra. Adobe has posted a document covering High Sierra compatibility with Adobe Creative Cloud applications in general (macOS High Sierra (10.13) compatibility FAQ | Creative Cloud). It links to a number of application-specific documents which I’ve also linked to below. The Photoshop team posted the document Photoshop and High Sierra | macOS 10.13 listing the issues they’re aware of. If the High Sierra upgrade converted your boot volume’s file system to the new APFS file system, in Photoshop CC 2017 or earlier you won’t be able to assign your boot volume as a scratch disk in the Scratch Disks section of the Preferences dialog box. This is fixed in the 2018 release of Photoshop CC. For Photoshop CC 2017 or earlier, if you have an HFS+ volume mounted, such as a partition or external drive, you can still assign that. Just keep in mind that a scratch disk should be both large and fast. Even though the list of scratch drives is blank in Preferences, Photoshop doesn’t display an error, and continues to work. There’s also a Scratch Disk settings dialog box you can pop up by pressing the Command and Option keys as Photoshop starts up; that does list an APFS boot drive (as Startup, not as its volume name) and appears to allow it there. This may mean Photoshop is able to use the APFS boot drive anyway, but isn’t reporting it properly in the Scratch Disks section of the Preferences dialog box. It is unlikely that this will be fixed for versions of Photoshop earlier than CC 2018. The Lightroom team has posted a compatibility document (Lightroom and High Sierra | macOS v10.13). However, it lists only one issue; to see other issues discovered and being discussed visit the official Lightroom Classic CC Feedback page. If you are running Lightroom 1–5, you may also want to review the Adobe compatibility document for macOS Sierra (Lightroom and Sierra | macOS 10.12), because older versions of Lightroom have several known compatibility problems with macOS 10.12 Sierra and later. Victoria Bampton (the “Lightroom Queen”) also has information (Lightroom and macOS High Sierra Compatibility), about current and older versions of Lightroom. Some of the issues may be fixed in Lightroom Classic CC. Some Lightroom presets may fail to sort in alphabetical order in High Sierra; Adobe has acknowledged this issue at feedback.photoshop.com. This is at least partially fixed in Lightroom 6.13 and in Lightroom Classic CC (7). For a few users (not all), Lightroom 6/CC 2015 crashes on launch in High Sierra. Some have been able to resolve this by adjusting permissions on the Lightroom application folder. The Illustrator team posted a compatibility document (Illustrator and High Sierra). It lists issues with APFS, color management default settings, and GPU rendering. Some of those problems are fixed in the 2018 release of Adobe Illustrator CC. The InDesign team has posted a compatibility document (InDesign and High Sierra compatibility). There was a widely reported visual problem with the mouse pointer in Adobe InDesign on High Sierra. Investigation by Adobe and Apple revealed this to be an Apple bug. It’s fixed in the macOS 10.13 Supplemental Update which became available on October 5, 2017. Install it from the Mac App Store, Updates tab; or from the link above. I talked to product management. You should be good to go with macOS High Sierra right now. As an editor, I would not change the OS if I was in the middle of an important project, however. While not specific to High Sierra, one issue that may affect Mac users is that in Premiere Pro CC 12.1 or later, Adobe no longer supports Apple QuickTime 7 era codecs that were deprecated by Apple back in 2013. However, those codecs still turn up in a lot of places so people (like me) are finding problems with those clips may no longer work properly in Premiere Pro. The only workaround at this time is to use the Creative Cloud desktop application to uninstall Premiere Pro CC 12.1 and reinstall version 12.0.1. The After Effects team has posted a compatibility document (Known issues in After Effects CC (15.1)). Adobe software older than the Creative Cloud (CC) versions are not officially supported on macOS 10.13 High Sierra. That doesn’t necessarily mean they won’t work; it just means that if those old versions have any new issues related to macOS 10.13 High Sierra, there won’t be any updates to address them (in other words, the only version with the High Sierra fixes will be the current version). I have upgraded my test Mac to the release version of High Sierra. Based on some quick tests I did, Adobe applications before CS6 do not run as smoothly as they did in earlier versions of macOS/OS X. The CS3–CS5 applications seem particularly risky to me. There are more hoops to jump through to get the installers to work (see below), and I’m having trouble getting some installers to accept serial numbers they accepted in Sierra. While I can install and run Photoshop CS3 and CS4, some of the older CS3/CS4 applications like Illustrator and InDesign aren’t starting up properly for me. CS5 applications run better, but some were crashing after I quit normally. High Sierra is the first macOS version where I really think it’s time for CS3–CS5 users to move on; the code in CS3 is a decade old at this point. Photoshop CS3 can at least install and start up in macOS 10.13 High Sierra. Adobe doesn’t test older (pre-Creative Cloud) software for compatibility because covering all of the features for multiple older versions would require extensive testing, and I also don’t have time to verify everything from importing to editing to printing. If you still depend on those old versions for serious production or need information about a specific feature (especially “does it work with my printer/tablet/scanner etc.”), you need to set up a test system to verify your workflow on High Sierra before upgrading your production system (see How to test macOS 10.13 High Sierra yourself below). And if your tests determine that your programs won’t run well under High Sierra but you want to upgrade, consider maintaining a system on a spare hard drive or partition just to run an older version of macOS for those applications. Many older applications have problems in High Sierra simply because over the years, Apple has changed so much of the code in OS X/macOS. Even Apple’s own professional software is affected; older versions of Apple Final Cut Pro, Motion, Compressor, Logic Pro, and MainStage won’t run in High Sierra (see About Apple Pro Apps and macOS High Sierra). With that in mind, here are some notes about getting older Adobe software to run in High Sierra. Be prepared to uninstall and reinstall if needed. Adobe applications were already installed when I upgraded my test Mac to High Sierra. After the upgrade, some older Adobe applications had licensing errors. I was able to fix these by uninstalling and reinstalling those applications, and the lesson here is to always make sure you have all of the information you need (such as license keys or registration numbers) to reinstall any of your key software. You may also need to reset Adobe licensing files on your Mac (see Registration servers, update servers, and activation servers below). There is no way to run Adobe CS2 software on macOS 10.13 High Sierra. The only option is to use a newer version of the software. The question of CS2 compatibility comes up during every recent Mac system upgrade. Some users moving up from older Macs running 10.6.8 or earlier to new Macs with the latest OS version may still be using the Creative Suite 2 (CS2) version of Adobe software, such as Adobe Photoshop CS2. As with the last several major Mac system upgrades, macOS 10.13 High Sierra requires that software be written for the Intel processors that have been running Macs for over 10 years. But CS2 applications were written for the PowerPC processors that ran older Macs. The last version of Mac OS X to run PowerPC software was OS X 10.6.8 Snow Leopard. A few more changes in High Sierra have potential implications for Adobe users. The file system is the part of the OS that keeps track of all your files. This is such a fundamental function that when that changes, there is great potential for big problems if the transition isn’t handled 100% properly. High Sierra is built on top of the new Apple File System (APFS), which is designed around security, reliability, and the ability to work across macOS, iOS, tvOS and watchOS. APFS will eventually replace the decades-old HFS+, but for now, High Sierra can work with APFS or HFS+. If your Mac’s system volume is on a solid-state drive (SSD), the High Sierra installer converts its file system to APFS; this is not optional. At this time, upgrading to High Sierra will not convert system volumes based on hard drives or Fusion drives, but that’s expected to happen in a later release. I haven’t had obvious problems installing or using older Adobe software on the APFS volume that’s created by default, but some of the random glitches I’ve seen in CS3–CS5 applications may be related to APFS. Some Adobe features that involve a folder or drive location (such as the scratch disk feature of Photoshop) may not work properly with APFS. Also, the Illustrator CC tech note linked above notes errors you may encounter related to APFS. When APFS was originally made available to developers for testing, it was case-sensitive. This raised concerns about Adobe application compatibility because most Adobe installers do not work on case-sensitive file systems. But during the beta period, Apple developed a case-insensitive version of APFS, and that is the version that the final installer for High Sierra uses when it converts a boot volume to APFS. Maybe that’s why many old and current Adobe installers still work in High Sierra. If you have trouble using a feature that interacts with the file system, it could be related to an incompatibility with APFS. Apple added support for the HEIF format in High Sierra. One reason is because it uses less space to save photos at the same quality level as JPEG. Because HEIF is a container format, it can use a single document to store image-related data such as the burst sequences captured by smartphones for animations, focus stacking, and exposure stacking, as well as extra channels and metadata — in other words, it’s a great way to store Live Photos, HDR images, and the depth map from an iPhone camera. The 2018 release of Photoshop CC adds support for HEIF; this requires macOS 10.13 High Sierra. Specifically, you can load an HEIF depth map into the Lens Blur filter. Lightroom Classic CC 7.4 also adds HEIF support. HEVC/H.265 provides more efficient encoding of high resolution video than today’s H.264 standard, especially for 4K resolution and up. HEVC can cut video file size by half without losing perceptible quality. My understanding is that Adobe Premiere Pro, Adobe Media Encoder, and other Adobe video applications already have support for HEVC/H.265. Even if you have the software to encode/decode HEVC/H.265, you also need fast enough hardware because it’s very processor-intensive. Older Macs can’t handle it, but the processors in newer Macs and iOS devices have hardware acceleration for HEVC/H.265 and HEIF. Some applications may not support an eGPU automatically, so if there is an application that you’re especially interested in accelerating with an eGPU, contact the developer to see if their application fully supports an eGPU. At this time, there is no official word from Adobe on which applications work with an eGPU or when compatibility updates will be available. Also, be aware that some eGPU solutions can accelerate only an external display. eGPU support should help address a big complaint about Macs: You can’t upgrade the graphics hardware of any Mac, unless it’s a Mac Pro. But with an eGPU, you can. The reason eGPUs are practical now is because of the data capacity and throughput that’s finally possible with Thunderbolt 3. It’s enough to smoothly drive a large display at a high resolution. While Apple was probably driven to add eGPU support to address the needs of augmented reality/virtual reality (AR/VR) developers, eGPUs should open up more graphics acceleration options for photographers, designers, and video editors. For example, instead of having to buy a 15-inch MacBook Pro just to get discrete graphics, you should be able to carry a thin, light 13-inch MacBook Pro around town, and then back at the office plug it into an external GPU that gives it a graphics card more powerful than anything found on a laptop. Apple has said that High Sierra is the last version of macOS that will run 32-bit applications “without compromise.” (They may still run in macOS 10.14 Mojave, which Apple has confirmed as the last version of macOS that will run 32-bit applications at all, but Apple won’t promise an optimal experience with them.) Most Mac applications have been written for 64-bit processing for some time now, so if your applications are up to date you may not have any issues here. But if you’ve been holding on to some old 32-bit applications for as long as possible, you won’t be able to run them in the macOS upgrade that comes after High Sierra. Wondering what High Sierra is all about? For the most in-depth review you’ll probably find anywhere, read the macOS 10.13 High Sierra review at Ars Technica. As with every major release of the Mac operating system, the Ars Technica review not only evaluates the visible features that Apple promotes, but goes under the surface to explain changes to some of the underlying technologies in macOS and how they affect your Mac experience. As usual, I will probably wait a few months to upgrade my production Mac to High Sierra. That will give Apple, Adobe, and other developers to release any necessary updates needed to make everything work smoothly together. This article was originally posted on September 25, 2017 but continues to be updated as new information emerges. Photoshop CS6 works fine while InDesign CS4 doesn’t on my Mac. It starts but all windows don’t show content (just graphics garbage). Same here. My Photoshop CS3 is working fine but my InDesign CS3 won’t show any content or panels. I don’t have the installation discs or serial numbers because it was all installed by my employer, and I work off site. I’ve installed the Java patch but it does nothing. That sounds a lot like how others have described InDesign CS4 looks in High Sierra. It may be the same problem in InDesign CS3, and if so, no one has found a way to fix it so far. 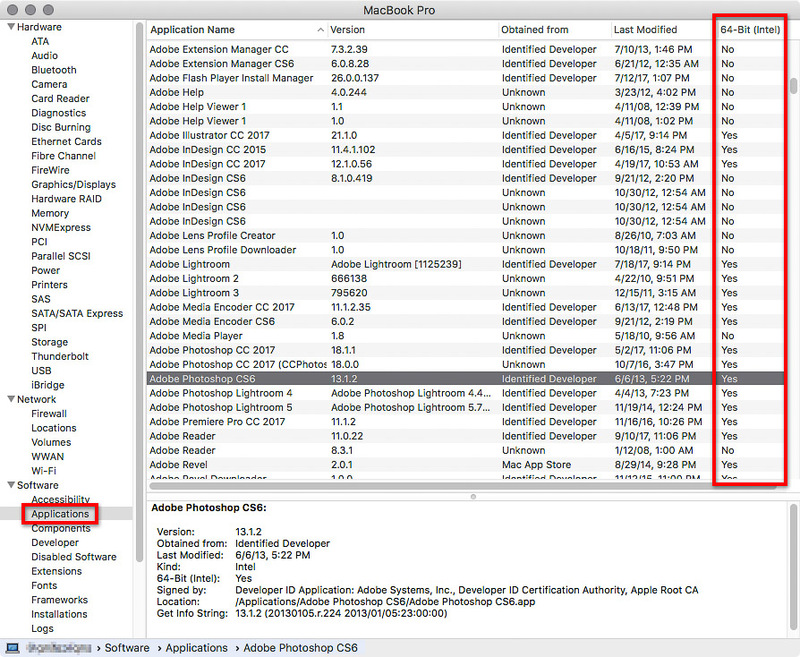 Although Photoshop CS6 is 64-bit, Adobe Bridge CS6 is only 32-bit, so will that cause a problem? Good example. High Sierra still runs 32-bit applications, so Bridge CS6 should be OK (although I need to try it to make sure). What I wrote is that High Sierra is the last macOS that will run 32-bit applications, so it’s whatever macOS comes next that will probably not run Bridge CS6. Can you reaffirm that Adobe Illustrator CS5 runs? I tried a copy of Illustrator CS5.1 that was installed part of one of the Creative Suite installers. It started up and worked fine for the couple minutes I tried it, but after I quit normally, the macOS crash reporter came up. I have not yet tried if the old “crash on quit” workaround from 10.11 and 10.12 still works. And we’ll have to hear from more people to see if this is typical. Hello Conrad, i tried to install some applications of adobe master collection cc 2017 in high sierra but the only one that works for me is photoshop, i need to install after effects , premiere and audition, can you give me any suggestions? Do you mean that you were able to install and run Photoshop CS6 using the CS6 Master Collection installer, but the others wouldn’t install? What happens if you try to install After Effects, Premiere Pro, and Audition, does it show a specific error? I should say that I haven’t tried to install the CS6 video applications in High Sierra. Could not agree more. Apple seems to have forgotten who made them a viable option in the first place. The design community. There should never be issues with designers industry standard software. Absolutely agree! As a photographer, I only use Pshop to tweak my photos. So I’m stuck using CS3 because I refuse to pay for a subscription. Adobe apparently only cares about the $$$ they can garner (especially) from corporations who can afford it – and have blown off artists who needed it. I wasnt able to install anything from Adobe CC on freshky installed OSX 10.13. Adobe is playing dumbs and the are not abke to help me. They offered to close my subscription when I told them that it’s riddiculous to pay for something what is not working on new OS… Adobe became a Microsoft of creative world…. Hi I have CS3 and it keeps crashing (illustrator) and Indesign does not open completely. I have installed the JAVA as prompted. Any suggestions apart from reinstall? What you described is similar to what I noticed about Illustrator CS4 and InDesign CS4 in the article. It looks like old CS3, CS4, and maybe CS5 are getting to be enough out of sync with the operating system that they may not be reliable in High Sierra. CS4 is almost 10 years old. I am not sure how to fix those problems, but if I find out anything I’ll post it. Hi Conrad, I have CS4 InDesign problem too. I own CS4 and would really like to keep using it for personal projects. Any help welcome. Any suggestions on how to install CS3? I’m not using it professionally, but it’s nice to have on my personal computer without having to print home my work MacBook Air. Hi Liz, it sounds like more than one problem is happening here. Both are somewhat related to the age of the software. One thing you mentioned was that nothing happens when you double-click the Setup file. That might be the problem I mentioned above in “ ‘Installer Failed to Initialize‘ error, or installer failing to run,” so you might try the workaround mentioned there. It’s covered in this blog post, but it’s sort of buried in the section “Registration servers, update servers, and activation servers”. A nice side effect of downloading new installers is that you won’t need to install them from an external disc drive anymore. You can just run the replacement installer you downloaded. Just remember to back up the new installer afterwards; you may need to use it to install from in the future since your original discs won’t activate any more. Thanks for this. I actually reached out to Apple Support since I just bought the laptop. They suggested I restart it in SafeMode, and I was finally able to install. Once installed I put in my key, which didn’t work anymore, but with Adobe I was able to enter my old key and they issued a replacement key. Everything is working now. Here’s the final directions Apple Support told me to do, that worked. Maybe it was a cache issue. Liz, did you get CS3 InDesign running? I have Cs6 and already having issues. The main problem I encountered immediately is when trying to SAVE AS JPG – it’s creating a PSD file extension. If I delete the extension – the file becomes unreadable to other people. So i have to manually type .jpg every time I save as a jpg. I can only imagine how many more problems I will encounter. Thank you for this post. Although my macbook pro seems to start a little slow (running 10.9.5) Photoshop CS3 is still working…as is Bridge – so I think I’ll just leave well enough alone – since I use CS3 & Bridge for all my photo work. I refuse to pay for monthly Cloud photoshop. Again, thank you. my photoshop CS6 runs but is sooo slow – how can i fix this ? It’s hard to say without knowing what you’re working with. What kind of Mac is it, what processor, how much RAM, and does it use a hard drive, solid state drive, or Fusion drive? Also, what image sizes do you normally work with (for example, 3000 x 2000 pixels)? I’ve read discouraging things on CS6 Illustrator not working at all. Can anyone confirm? Currently on a 2012 MBP and would like to upgrade the OS, but I’m not willing to lose my adobe software. Also, can anyone confirm if Acrobat Pro 10.1.16 works? Thanks, this blog is very helpful! It just asks for Java se 6 runtime …..which I have installed twice ? Which CS3 application are you having trouble with: Photoshop CS3, Illustrator CS3, InDesign CS3, or another one? Some run better than others. – Revert to your last complete system backup before the macOS upgrade. – Subscribe to the Creative Cloud Photography Plan so that you can use Photoshop CC. – If CS3 was sufficient for your needs, today’s Photoshop alternatives should be more than sufficient. For example, Affinity Photo and Pixelmator can both open layered Photoshop files, they are powerful, and very affordable. Thank you so much for your time replying I really do appreciate your advice , one more question if I may ? I fully accept your suggestion……so what adobe product ? In your opinion what is the closet product on the market today to photoshop CS3 ? I want to buy the program and not rent it , Lightroom , elements ? And clearly it needs to work on high Sierra ! Lightroom 6 is a possibility, but there are two issues with it. One is that it isn’t designed as a replacement for Photoshop; it’s more like a super-version of Adobe Camera Raw. The other issue is that Lightroom 6 (the non-subscription version) has just received its last update, so even though you can still buy it without a subscription, the only upgrade path from it now is Lightroom CC or Lightroom Classic CC, both of which are available only by subscription. Photoshop Elements might be a better way to go. While it doesn’t have all of the features in Photoshop, it includes a basic version of Camera Raw, and should be able to do the tasks you described. You can get Photoshop Elements 2018 without a subscription for around US$70. Adobe says it’s compatible with High Sierra (https://helpx.adobe.com/photoshop-elements/system-requirements.html). Now you know what those of us who depended on FreeHand have been through! Since Illustrator could not compete with it, Adobe bought FreeHand and are just sitting on it. They do nothing to support it let alone upgrade it. I finally installed Parallels running Snow Leopard so that I could use it, but it is slow. Now I am having trouble with my PS CS5. It will only print on 8.5 x 11 size paper. I have NO choices at all when it comes to printing except to push the print button! Adobe is nothing but a greedy monster! 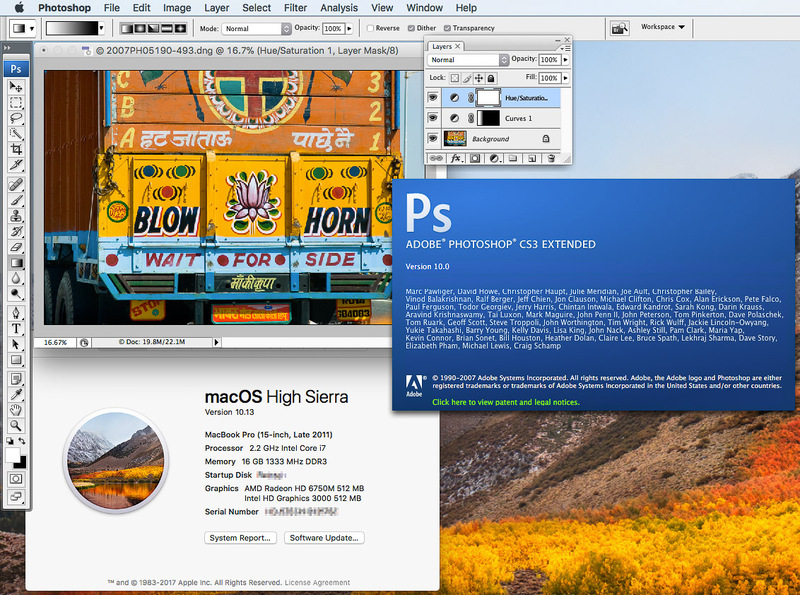 I am running High Sierra on my new Mac and I have installed with the help of Adobe, CS6. Every thing seems to be running smoothly but generating a PDF out of InDesign or Illustrator has the issue of washed out color… Does anyone else have this problem? I currently have Sierra running on a MacBook Air (not High Sierra) and CS3. All seems fine for me on all used. (photoshop and indesign) My only issue is that I want a blank background rather than my desktop picture in Photoshop showing around the artwork and I am unsure of how to do it. Anyway … in the end what is the overall outcome? Can I upgrade to the new format Hard disk APFS with High Sierra and CS3 will work? If not which programs Fail and there is no fix? Just need a list of software that works and which doesn’t then I will decide whether to keep Sierra or upgrade to High Sierra. Regarding the “blank background”: I think that’s the “application frame” that was introduced in Photoshop CS4, where you can choose Window > Application Frame. If you’re using Photoshop CS3, you probably don’t have that command. What we know is that several Adobe CS3 applications don’t work properly in High Sierra. Although I have been able to start Photoshop CS3 as shown in the article, that’s no guarantee that all of its features work properly, and some other Adobe CS3 applications have bigger problems like not starting at all. As far as a “final decision” or a “specific list of programs,” that isn’t available because while each of us uses different features in the programs, no one has thoroughly tested all features of all CS3 applications in High Sierra. That’s why, if you need absolute confirmation that the applications and all the features you specifically use are OK in High Sierra, you should install High Sierra on a separate test volume (like a spare external hard drive), and see if every part of your CS3 workflow works successfully on that test system. If you don’t run into problems, then you can upgrade to High Sierra on your production Mac. If you aren’t able to test your workflow, and you depend on these applications, then your choices are to not upgrade to High Sierra, or upgrade to High Sierra and also upgrade to current graphics applications. I am not very tech savvy and am trying to understand everything but have a question that I hope wasn’t already answered. I am working on a 27″ imac from late 2009 and have upgraded to 10.13.4. I work in CS6 Illustrator and PS and also acrobat pro. I have encountered minor glitches but nothing that really bothers me. My old computer is dying though and I wanted to know if I migrate the data to a new imac will there possibly be problems with the new HD or anything other than the OS? I know I was warned not to do the next upgrade of High Sierra so I would hope the computer would come with this one or earlier. I can’t afford to pay the monthly Adobe bill so I wondered if it would be more prudent to try to find an older used computer? Thank you so much for your help. Hi Tina, If you’re working with CS6 successfully in 10.13.4 you will probably be OK on the new Mac. Simply using the Apple Migration Assistant to move everything from your old Mac to your new Mac might work OK. It’s not possible to guarantee that it will always work, so the best thing to do is to always make sure you know where your original CS6 installer is, and where your CS6 serial number is. Because if you use Apple Migration Assistant and CS6 doesn’t quite work right on the new Mac, the next step is to uninstall and reinstall the applications. The cleanest way to do it is to sign out of everything you can on the old Mac before migrating (deactivate Adobe software, de-authorize the Mac from the iTunes Store and App Store, sign out of any other applications that connect to a server), and then after migrating, sign back into everything. This helps ensure that you don’t lose an activation when you stop using the old Mac. Good luck! Thank you so much. I will need to reread what you wrote as it is a bit difficult for me to understand. So when you say deactivate you don’t mean to uninstall just to deactivate then migrate? Thank you again. All of this makes me incredibly anxious. I’m sorry I forgot to ask. I did get a warning adobe_licutil is not optimized for your Mac. This app needs to be updated by its developer to improve compatibility. Do you think that could cause a problem on a new machine with data migration? Thank you again. Yes, so I’ve read all the comments in this excellent thread. I purchased one of the first Mac Pros in 2006 and was shocked when Apple dropped support for that very expensive machine only six years later (five for those who purchased a 2,1). As a small designer operating in the lower market segment, I can impossibly afford a new 3000$ machine every 5-6 years. Such an investment is calculated for at least 10 years. I am even more frustrated to see that never Mac Pros are now supported way beyond what mine was (a 4,1 that was built in 2009 supports High Sierra). And then there’s that problem. I purchased Adobe CS1, CS2 and CS3 and found that the last one did everything I needed in my job. Actually, the former version already did that but it was written in PowerPC code, so I upgraded just for it to run on my new machine. But now I’m stuck with the dilemma that Lion, which is the last OS to officially run on my Mac Pro, is slowly dying on the browser side and I need those browsers for web design, set apart that running an old OS online is not secure. Some say the fault is Adobe’s, others say it’s Apple’s but I say it’s both. Most absurdly, I can apparently run CS3 on a Windows machine under Win7 , 8 or 10 with no problems at all. Actually, I just purchased a used version of CS3 for Windows so if that may be any help to anyone: I know we all dislike working in Windows but that could be a viable solution until a better one shows up. A win 7 OEM license can be purchased online for as little as 3$ while a second hand version of CS3 for Windows set me back 180$ and I can install all of that on my Mac Pro. Not the nicest solution but certainly a workable one for the small designer. I know how I will miss BBedit on the Windows side but hell, at least my design setup works and for FTP, of course, no more Transmit but then again, Filezilla works on both OSes. Hi Conrad, Is this the support that you mentioned would come along at some point? https://support.apple.com/kb/DL1572?locale=en_GB (Download for Java 2017 -001). I usually wait until the last possible minute before I upgrade my Macs, but do follow it throughout the year. With this whole 64 bit thing and my CS6, High Sierra might be my last for this machine. PS Thank you for all your valuable insights into this. You are greatly appreciated out here in the interwebs. Hi Bridget, the Apple link you posted helps address just one potential Java-related compatibility issue for CS6 in High Sierra. However, that download does not address the other potential compatibility issues listed for CS6 in High Sierra. You might be right that High Sierra might be the last macOS that will be practical for running CS6 applications. 1) Thanks for the info! I too find myself in this quagmire… I have been running CS4 on Mavericks 10.9.5 on a 2008 iMac. I refuse on principle (and can’t afford) a monthly leash to Adobe. I stopped updating my OS exclusively due to the utmost necessity for CS4. I’ve been phased out of Safari and Chrome, but can run Firefox (for now). I will not be able to do my taxes with TurboTax this year. So it’s time. I’m looking for a version of CS6 and a new computer, but it’s a really big puzzle! I want to stay functional as long as I can with whatever I manage to cobble together. One thing I’m debating is running an older OS on an external HD – but no real idea how to do that, and the compatibility issues that might be involved. I saw you mention it, but you didn’t provide a link on how to do it. I don’t know if you have presented that info elsewhere? At this point, I think I would go no higher than Sierra on a computer, and it’s just a gamble. CS6 was released with 10.6, so that is quite a jump! It just seems more prudent to set it up on an external with an older OS. Maybe I can increment it upwards? I have multiple unused HDs that I could set up. My only concern here would be potential compatibility issues between the main newer OS (hopefully up to High Sierra? I never want the latest right away) and the external. I’ve never set this up, so have no idea what I might run into. Any ideas would be appreciated, or links to how to achieve this. It seems to be the only option, because I don’t really want to be held back JUST because of my need for unsubscribed Adobe. I actually use CS quite a lot. It’s how I make my living.